Here is a graph and a table that shows mass/energy relationships for various types of batteries available to modelers. The battery data is taken from the MAXX/MPI web site (where those batteries can be bought). The second last column in the table below shows the energy capacity per gram (the specific energy of each cell) in Joules per gram (Joules/gram = Amperes*Volts*seconds/gram = 3600/1000*mAh*volts/gram). 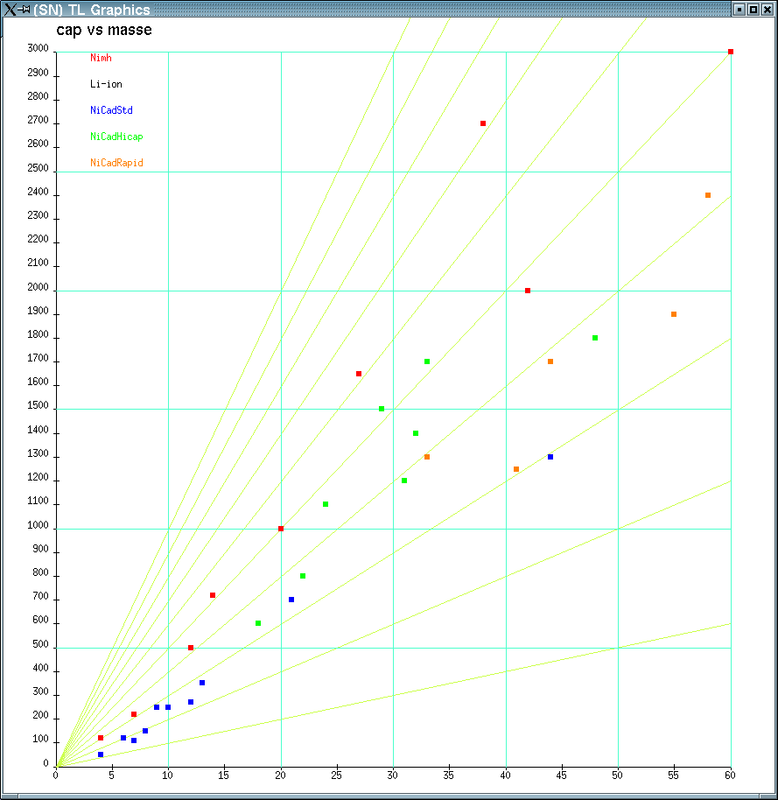 The graph below shows the energy capacity of each cell type as a function of its mass in grams. To make easy for the reader, the energy capacity is measured in mAh*v/1.2 (current*time*volt = energy). In this unit, the cell's energy capacity is equal to its nominal mAh capacity if its voltage is 1.2v. In these units, the 3.6v, 2000mAh Li-Ion battery id 6000mAh*v/1.2 (which is off the chart). The yellow lines indicate lines of constant capacity per gram. Batteries situatued on steeper lines are better. For example, the Sanyo NH-720AAA NiMH seem to have an excellent energy to mass ratio (720mAh for 14 grams), and so do the Sanyo NH-1650AA Nimh (1650mAh for 27 grams) and the Sanyo NH-2700A Nimh (2700mAh for 38 grams).